In the applet below, A and B are 5 units apart. (This distance will change if you move point B, so keep it where it is for now.) Slide the green unlabeled slider. What does this imply about the two lines? Nonetheless, the goal of this problem is to determine how far (to the left) D needs to be placed from C in order to minimize total area enclosed by both triangles. Even though you can use this applet to obtain an approximate value of this distance, use calculus to determine an exact value of this approximate distance. Retry this problem for AB = some other distance. (You can move point B to make this happen.) What if AB = x units? 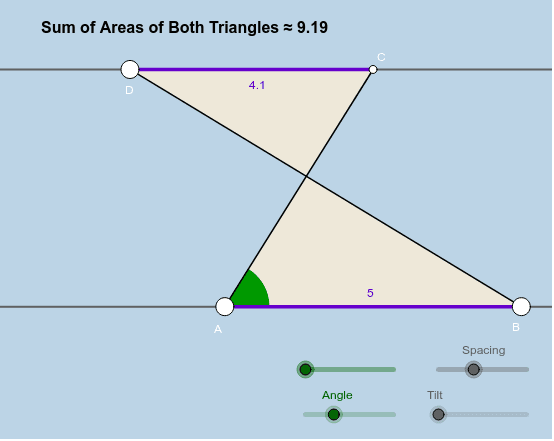 Can you find an expression (in terms of x) for the distance DC that minimizes the sum of the areas of both triangles?